Although it's rather hard to forget as the battle for our very existence continues to this very day. Are They Coming to Unite With or to Divide Jerusalem? You've probably seen a sticker like this somewhere showing USA in bold letters at the center of the word Jerusalem. But, you probably have not seen it quite like this. America says (and most Jews believe it) that Israel has no greater friend and ally than the USA. But, there are those who suspect that nefarious plans are being laid by The Powers That Be (TPTB) to somehow take control of Jerusalem.And reports like this one don't dispell their doubts. DEBKAfile April 28, 2017, 9:48 AM (IDT)US President Donald Trump refused to confirm the prediction by Florida Republican Rep Ron DeSantis that he would announce the relocation of the US embassy to Jerusalem when he visits Israel in late May. In answer to a question, the president said: “Ask me in a month on that.” He went on to say: “I want to see peace with Israel and the Palestinians. There is no reason there’s not peace between Israel and the Palestinians — none whatsoever.” Trump receives Palestinian leader Mahmoud Abbas in the White House on May 3. 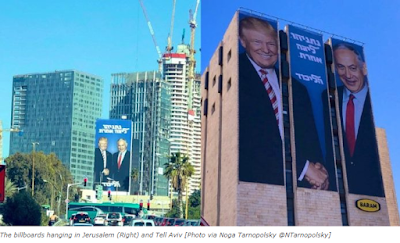 President Trump will be visiting Israel for the first time in office during the week when Israelis will be celebrating 50 years of a reunited Jerusalem under Israeli sovereignty. I personally have no fear whatever that TPTB will give ancient Jerusalem to the Arabs to be the capital of a Palestinian State. But, I do worry that they will do what they have always planned to do and that is take it from both the Arabs and the Jews and internationalize it. The West, led by the Pope, will never allow the Christian holy places to be placed in the hands of the WAKF. And if the true indicator of what is going on behind the scenes vis a vis Israel and the Jews is the natural disasters HKB"H sends their way then they are plotting against us, then this video might be telling us that there is what to be concerned about. 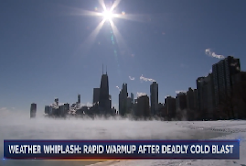 Jaw-Dropping* 'Superstorm' rapidly forms covering HALF of USA! One looks around at the world today and wonders if there has ever been a more selfish generation than the one which currently inhabits this planet. Selfishness and self-adulation are the natural traits of a person who has become his own god. There is no higher purpose than his, no higher need than his, no higher will than his and his views, his thoughts and his feelings will always be the final arbiter for every decision he makes. He is at the center of his own world and, given enough attention, he will eventually begin to think that he deserves to be the center of the entire world. To this day, there are people who think the Satan is the good guy in this story and believe his lies that HKB”H had evil intent and wanted to limit human potential when He forbid Adam and Chavah to eat the fruit of the Eitz Tov v’Ra. The most faithful followers of the Satan do not worship him, they worship Self. But, despite their dispersion and the confusion of languages, they didn’t give up. Generation after generation they have labored to reach the point once again of one language in one interconnected world with the goal of deifying mankind, of replacing HKB”H. Instead of the Torah, they will have humanism and they will recreate the world in their own image with GMO plants, gene-spliced animal species, “three-parent” children and a race of sentient robots to serve them. What a nightmare! However, rest assured that this world is not hefker., It has not been abandoned by its Owner. He is watching and taking note and will surely intervene before the point of no return, just as he did once before. HKB”H loves His creation and will not see it destroyed, but the evil deeds of mankind will surely be destroyed. Operation Gotham Shield: U.S. Gov't To "Simulate Nuke Blast Over Manhattan"
North Korea is preparing to celebrate another major holiday this coming week: Tuesday will be the 85th anniversary of the founding of the Korean People’s Army, and the North often uses such occasions to show off its military advances. “Given the North’s recent provocative words and actions and its April 25 People’s Army anniversary, there is concern that the North can attempt a provocation at any time,” South Korea’s acting president, Hwang Kyo-ahn, said Thursday. I don't know any more than you do about what may or may not be with Nibiru or whether it is even really out there. However, our Tanach tells us that massive earth changes are coming and we see it happening with our own eyes. Whatever HKB"H is using to bring it about is really irrelevant to the event itself. ...One bomb at a time. "...Frustration among the president’s allies has intensified in recent days, with many expressing worry that Bannon, the intellectual pillar of the nationalist movement that catapulted Trump to the presidency, is being pushed out. As Bannon’s influence wanes, on the rise is a small group of Wall Street-connected advisers whose politically moderate and globalist views are anathema to the populist cause." Twenty-one years ago this Shabbat, I arrived with my family on aliyah to the Land of Israel and, by God's grace, have never left even once. For this double blessing, I will be forever grateful to HKB"H! Of course, a chemical gas attack is being used to seriously undermine Assad's regime. That's because the whole war in Syria is being waged for the sake of protecting Russian hegemony in the supply of gas to Europe! I wrote about this before in depth here and here. In short, Russia has had Europe over a barrel for years with its monopoly on their natural gas supply. The only serious competitors can only reach Europe via a pipeline through Syria which Assad won't allow because Russia is his patron and he is bound to do the Kremlin's bidding. And this is why Russia is so deeply involved in defending the Assad regime. Gas sales to Europe is part of the lifeblood of the Russian economy. They are not about to lose it by giving up their influence there. “Russia Cuts Gas, and Europe Shivers,” the New York Times reported on January 6, 2009, after Russia shut off gas exports to Europe due to a pricing dispute with Ukraine. From France to Turkey, nations across Europe went without power — and the incident underscored Russia’s outsized hold on European gas supplies. Fast-forward nearly a decade later, and Europe is on the verge of relief from an unlikely source: Israel. While approximately 60 percent of the world’s oil reserves are found in the Middle East, none of them are found Israel. Israel has been striving for decades to reduce its reliance on foreign sources of energy, by developing nuclear and solar technology, among other methods. Then the game-changer occurred: the discovery of the Tamar and Leviathan natural gas fields off the coast of Haifa in 2009 and 2010. They were among the largest offshore finds in the world. ... Israel’s new gas fields will make the Jewish state a global energy player for the first time in its history, greatly altering its political and economic clout throughout the Middle East and Europe. Steinitz has said that he sees the eastern Mediterranean becoming the new North Sea. Jordan has already signed a $10 billion deal to import Israeli gas, and Europe is next. Israel, Cyprus, Greece and Italy recently agreed to a $6.4 billion plan to construct the world’s longest underwater pipeline, which would bring Israel’s natural gas into the European market. The deal was supported by the EU’s Climate and Energy Commission, which said that it would help limit reliance on Russian-supplied gas. This article is from two days ago. Don't expect Russia to sit still for this. May all of Am Yisrael together experience the ultimate freedom this Pesach - the complete and final redemption! "The Hidden Story Of Pesach"
Very worthwhile to hear. Listen while you cook and clean! Arutz Sheva - Clean Up Your Act! "In Nisan we were redeemed and in Nisan we will be redeemed...."
And it seems that once again, we will be redeemed from Egypt. With G-d's help, I will be developing this idea further in the coming days, as time allows. Meanwhile, take a look at what is happening right under our noses. The Jerusalem Municipality and the Simon Wiesenthal Center are refusing to talk about planning and content of the new museum. The high fence concealing the site on which the Jerusalem Museum of Tolerance is being built does not really keep passersby from seeing what is going on there. In central Jerusalem, on the site of a Muslim cemetery that is part of Independence Park, stands a huge oddly-shaped and proportioned concrete building. What will it look like? What will happen in it? What does its design mean? What will it contribute to the urban environment? None of this is clear, and it seems that there is a conspiracy of silence about it. When I tried to ask the Jerusalem municipality spokeswomen about this, I was referred to Jerusalem architect Yigal Levy, who wanted to speak, but instead referred me to the representative of the developer, the Simon Wiesenthal Center. They called me from overseas, made inquiries, got back to me, and said that the financers were suffering from "press trauma," and would not talk. A perusal of the Simon Wiesenthal Center website shows that it calls itself "a global human rights organization researching the Holocaust and hate in a historic and contemporary context." The organization's main offices are in Los Angeles, but it has branches all over the world. The organization is headed by Dean Rabbi Marvin Hier. Jared Kushner, President Donald Trump's son-in-law, selected Rabbi Hier to recite a prayer at Trump's inauguration. The Museum of Tolerance in Los Angeles, founded by the Simon Wiesenthal Center in 1993, is described as a "human rights laboratory" and educational center for increasing awareness of the Holocaust of the Jewish people and tolerance. According to the museum's website, 250,000 people visit the museum yearly, including 130,000 students. The Jerusalem museum is portrayed as "a multi-faceted educational institution and social laboratory in the heart of Jerusalem that speaks to the world and confronts today’s important issues - like global anti-Semitism, extremism, hate, human dignity, and responsibility, and promoting unity and respect among Jews and people of all faiths." According to the US website, the building will house experimental museums for children and adults, a center for art seminars, an educational center, and a theater. ...According to the museum's website, the place will be managed by rabbis. ...Jerusalem Deputy Mayor Ofer Berkovitch, a cofounder of the Hitorerut B'Yerushalayim movement, is responsible for economic development, culture, and the city center. He says that he tried to contact the developers several times, but they refused to cooperate. "This is a foundation that is ostensibly very serious. They raise a lot of money, and this is an enormous building. I asked for the plan and the content, and proposed building a museum of Israel music there… They didn't answer me, and that's worrying. It arouses questions and doubts," he complained. 14,000 square meters, six floors above ground, and four floors below ground. Note: Comments are open for discussion of this subject. It might be prudent to get your Pesach shopping done early. ...The book "Otzar Midrashim" is a description of the redemption, as Rabbi Shimon bar Yochai heard from an angel while hiding in a cave. In the Midrash, it shows a section that appears to refer to our days: "And it's a sign for you, when you see that an Eastern Nero has fallen, that in Damascus has fallen the Bnei Mizrach kingdom, then will sprout the salvation of Israel, and Mashiach ben David comes and will ascend to Jerusalem." Tuesday's chemical attack in the Idlib province of Syria is suspected to be the deadliest chemical weapon attack in Syria in years. Israeli officials believe that the attack, which claimed the lives of close to 100 civilians and wounded hundreds more in the town of Khan Sheikhon, was a sarin gas attack order by President Bashar al-Assad's regime. Have everything on hand (and then some) that you are going to need to fulfill the mitzvot. It's best to be prepared for any eventuality. "T.K.O. Purim & Pesach, the FINAL PUNCH!!!" 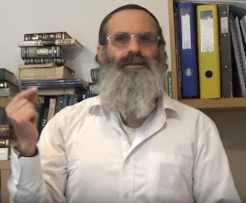 Rabbi Yehuda Richter on "T.K.O. Purim & Pesach, the FINAL PUNCH!!!"